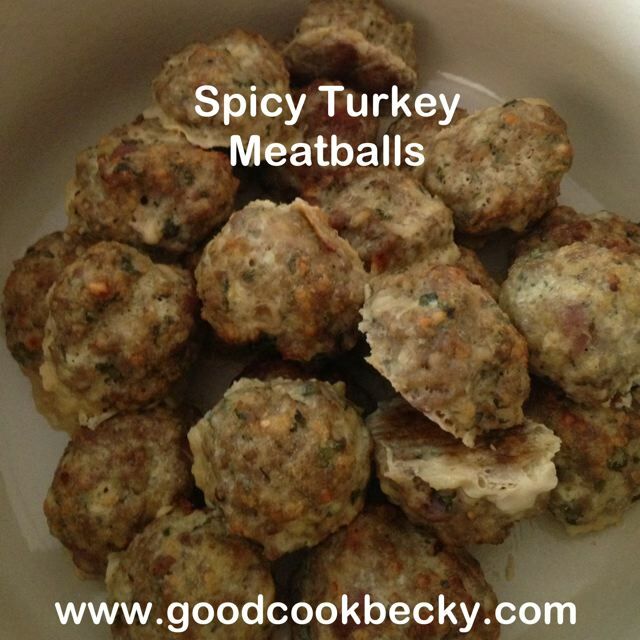 Here is another wonderful recipe that I have made that Ina Garten has in one of her cookbooks as well as on Food Network. I am a sucker for mushrooms and so far all of Ina’s recipes that I have tried have been winners. 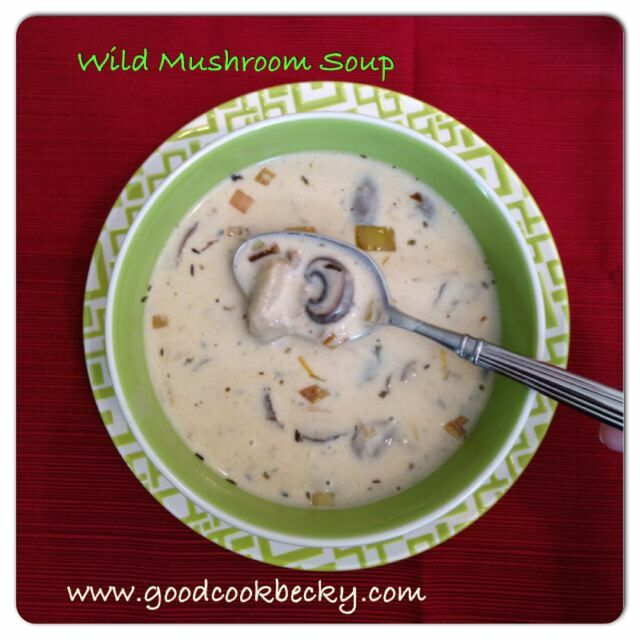 Mushrooms are matter of taste however, not everyone in my family loves them, but if you do, make this Cream of mushroom soup! It is quite good! Clean the mushrooms and trim the stems and remove any parts that have gone bad. Separate the stems from the caps. Coarsely chop the stems. Place the chopped stems in a stock pot. Slice the mushroom caps and reserve for later usage. To make the soup base: heat olive oil and 1 Tbsp of butter in a large pot with the stems. Add the onions, carrot, sprig of thyme and 1 tsp of salt and 1/2 tsp pepper and cook over medium heat for 10 to 15 minutes until the vegetables are soft. Add 6 cups of water and bring it to a boil. Reduce the heat and summer for 30 minutes. Strain the broth, reserving the soup base. Discard the vegetables. If you do not have 4 1/2 cups of soup base, add some water. In the meantime, heat a large cast iron skillet and melt the remaining butter. Cook the leeks over low heat for 15-20 minutes, or until the leeks begin to brown. Add the mushroom slices and cook them until they are golden brown for another 10 minutes. Add the flour and cook for 1 minute whisking constantly. Add the white wine, stirring continuously to loosen any remains from the bottom of your skillet. Add the soup base, minced thyme, 1 1/2 tsp salt and 1 tsp pepper and bring the soup to a boil. Reduce the heat and simmer for 15 minutes. Add the half and half and cream, parsley, season with salt and pepper and heat the soup through over low, but do not boil Serve with crusty French bread. Categories: Ina Garten, Main Dish, Main Dish - Soups | Tags: Ina Garten, Mushroom Soup, Mushrooms, Soup | Permalink. Recently, my daughter requested crab cakes for dinner. I was actually surprised that she wanted them, I was sure it was salmon cakes she liked, but to be honest I was happy to oblige. I like Crab Cakes. When I think of crab cakes, I think East Coast, but as I live on the West Coast – I also think Disneyland Blue Bayou crab cakes. They are good! I found a nice recipe in one of my many cookbooks: America’s Test Kitchen Family Cookbook (page 281) I doubled the recipe because the recipe served 4 and we are a family of 5. I took leftovers to a neighbor, who said the crab cakes rivaled those served in a fancy restaurant. It made me smile. This truly is a good recipe! They make very large crab cakes though, so I probably would have been okay keeping the recipe at 4 servings and making the crab cakes slightly smaller. I added a kick of creole seasoning (Konriko brand is my favorite seasoning, that is available through the internet). In a large bowl, using a fork gently combine the crab meat, dry breadcrumbs, scallions, parsley (or other spices), Old Bay Seasoning, Creole seasoning. Add the mayonnaise and gently fold it into the crab meat. Taste the mixture and add salt and pepper if necessary. (If you are adding creole seasoning it may not need any and if you are not using it then increase the Old Bay seasoning to 1 Tbsp.) Gently fold in the beaten eggs. Add more breadcrumbs if necessary. I used less than called for. Divide the crab meat into 8 equal portions. Gently form them into balls and flatten them slightly. They are quite large almost fist sized. Cover the crab cakes with plastic wrap and cool for 30 minutes or longer. Heat 1/4″ canola oil in a non stick skillet, or cast iron skillet over medium high heat. Remove the crab cakes from the refrigerator and lightly coat them in flour just before frying them in the oil. Fry them until golden brown, about 5 minutes on each side and remove them to a platter and keep warm while you finish cooking the remaining crab cakes. 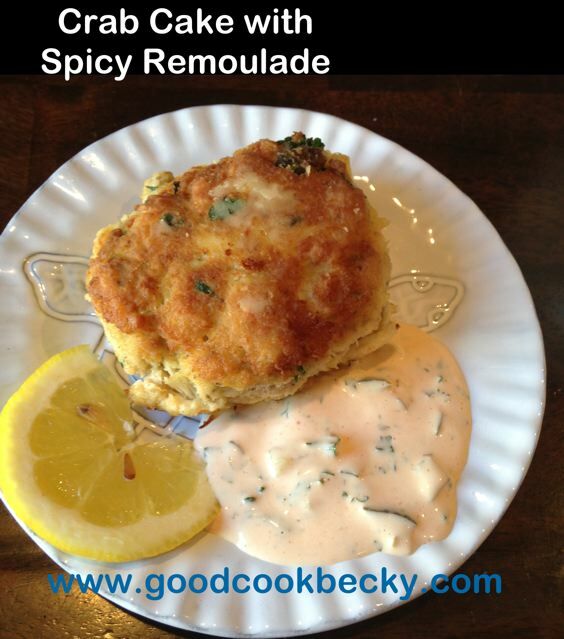 Serve with lemon wedges and Spicy Remoulade Sauce if you wish. Combine the mayonnaise, chopped dill pickle, chopped capers, lemon juice, mustard, and parsley. Taste and add hot sauce and salt, until you like the taste of the sauce. Categories: American Test Kitchen Recipe, Main Dish, Main Dish - Seafood | Tags: America's Test Kitchen, Crab, Crab Cake, Remoulade Sauce | Permalink.